How to get your blog noticed? That’s a million dollar question, isn’t? Given that there are thousands of blogs that are started everyday, getting your blog noticed by your target audience is THE most challenging thing. You could be putting your blood and sweat to develop your blog. You could be creating awesome content. But still, if your blog is ignored by your target audience, all your efforts go wasted, right? In particular, this can be a very difficult task for new bloggers. It is often intimidating to try to figure out how to get noticed by other bloggers and readers. To develop a following can be a challenge when you start out. Some of these blogging tips will help new bloggers start getting noticed and getting their voice to be heard. So in this post, let me answer this plain and simple question: How to get your blog noticed by target audience (and/or potential customers)? Note: Before I start sharing those tips, I assume that you have first identified your target audience. Because, without that crucial step all your blogging efforts will simply have no meaning whatsoever. If you have not found your target audience yet, it is time to do that first before you start implementing any of the tips shared in this post. … on a regular basis and make sure your readers can leave comments. No matter how great your content is, if your readers cannot easily leave comments it will be hard to build your blog up into a blog where people want to come back to. I have been to blogs and tried to participate in the discussion only to find that I cannot always leave a comment due to the blogging platform or the design. If I can’t leave feedback I don’t usually bother coming back to the blog. I like blogs where I can interact with the author and other people of the community – and so do your readers. Ask your readers questions and leave a way for them to respond and remember to follow up on comments. Remember, blog comments are great opportunities for you to read your readers’ minds. By opening up comments on your blog, you open a portal where you can interact with your readers. It gives a chance for you to converse with them, which is a great opportunity. Blog comments are also a great way to reduce your blog’s bounce rate. You can also interact with your readers outside of your blog in social media and on other blogs by interacting via comments. You should interact with other bloggers and also people who specialize in your area of interest. Join blogging groups that have the same interest as yours and actively leave comments. One such community that I run myself is DoSplash. Blogging communities like DoSplash are a great boon to newbie (and even advanced) bloggers where like minded bloggers can come together, establish contact and help promote each other’s work. Become a member of writer’s forums and leave posts so people start recognizing your writing style. Wherever you go, make sure you offer value. 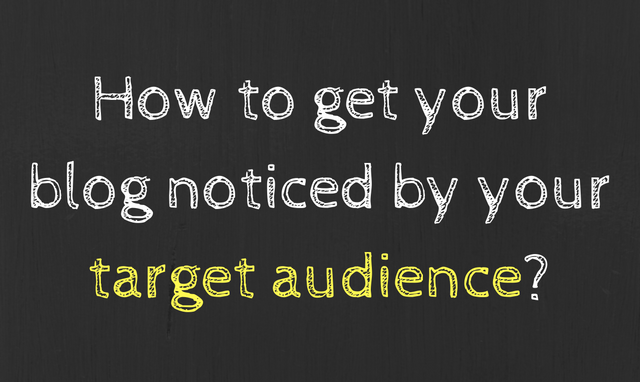 Target the audience that you are trying to reach with your blog (remember I talked about your target audience in the introduction?). Make sure that the types of posts that you are writing is something that your audience will be interested in. Talk to the people who read your blog in a friendly conversational tone. Blogging is a combination of having a conversation with a friend and delivering information that the person would need. Of course, all this must get accomplished while still having great grammar and spelling. So how can you make sure that the content you create is of useful to your target audience? You first need to identify your target audience and then identify their problems and pain points. This can be accomplished by talking to them via comments, in social media conversations, forums, blogging communities, or by running a survey – the choices are abundant. Once you have knowledge about your target audience and their requirements, you need to create awesome content in order to attract them to your site. If you need help with content creation, I highly recommend you to take up my content creation course. Learn to love social media and connect all the social media platforms that you use to your blog (you don’t have to use too many!). Make your blog posts Twitter-friendly, and tweet blog related information. For instance if your niche is Mommy blogging tweet ways to tackle working from home, ideas for keeping kids entertained, and tips on how to manage time. Youtube videos not only help boost your blog’s rankings but also help establish rapport with your audience. You can also tweet quotes about motherhood and uplifting cute mom moments. If you are a blogger you need to know how to connect with the most people you can, in the shortest amount of time. Think bold while you conceive the idea and make it a blog post. Find the controversial topic in your part of the blogging world and take a stance on it. Write something that is completely outside of the normal realm of blogging but still related to your current ideas and post it. Try new and innovative techniques that you have not seen before and see if they work on your blog. Leverage on your productivity to become better at content creation. Invite guest bloggers and write guest posts for other blogs. It goes without saying that the more exposure you get the better off you are. Writing guest posts allows you to gain experience while writing in different “voices” than the voice that you normally use. Your guest posts can start out as free for exposure and perhaps move on to paid guest posts after time. How to get your blog noticed? Takeaway! Unless your blog is noticed by the right people, you can only dream about its success. I am not saying this to scare you – but it is just plain fact. No matter how hard you work on your blog, how much money you invest, or how great your content is – the key is to get your blog in front of the right eyeballs. Once that is done, you can surely succeed, because traffic is the lifeblood of a blog – and by traffic, I mean, the right kind of traffic. I am pretty sure these tips will help you with that because these are the tips that helped me accomplish the same. Oh and one final thing – don’t forget SEO. Jane blogs at Savvy Blogging Tips , where she shares brutally honest blogging tips for bloggers of all levels.